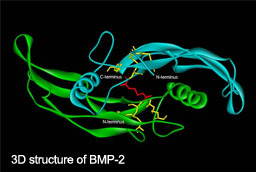 Challenge: Clinical use requires huge amounts of Bone morphogenetic protein-2 (BMP-2) due to unfavourable release kinetics. This leads to high costs limiting clinical use. Solution: Morphoplant's coating technology for BMP-2 immobilization allows for controlled release therefore minimizing the amount of BMP-2 needed for osteoinduction. Morphoplant’s coating technology is applicable to bovine, human, synthetic and phycogenic bone replacement materials.